I have many local Japanese members who would love to help them to enjoy various Japanese dishes at izakaya restaurant with chatting about each other's country. Izakaya is a Japanese common style restaurant to enjoy dinner and sake, and a place of social gathering for Japanese people to go with friends or coworkers after work. 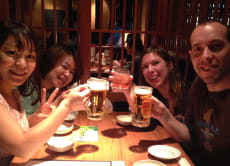 Enjoy Japanese Dishes with Locals at an Izakaya in Tokyo! Had a great night with extremely friendly people. Would definitely recommend for anyone interested in getting to know new people and experience the true Tokyo. There are so many amazing spots in Tokyo, yet as a visitor to the city, they're almost impossible to discover. Kei was a wonderful, welcoming host. We had a fabulous time going to an izakaya restaurant on the 5th floor of a building, with a small stream, trees and individual rooms. A stunning place, and food beyond compare! 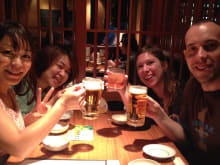 We had great conversations about life around the world, the quirkiness of languages, and life in Tokyo. 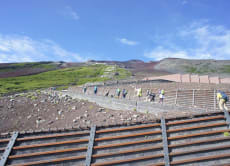 I couldn't recommend this experience more - do it towards the beginning of your trip, as your host will undoubtedly suggest activities not covered by travel guides! Naoki and the other locals we met with were very friendly and great company. We went to an amazing restaurant and had a lot of good food and drink. Well worth the money. This was the best experience we had while in Japan and I would suggest that everyone do this upon arrival to learn their customs and interact with locals who are more than eager to provide advice. This worked out well. I loved talking to Satoko about everything and the chance to hear about life in tokyo from genuine people.